Did you know a thief can remove your catalytic converter in under two minutes? Thieves target vehicles that are parked in all locations at all times of day. They are stealing catalytic converters for the recycled metal value and because catalytic converters are typically easy to steal, thieves can steal dozens in a day. Because catalytic converter theft is steadily increasing both nationally and internationally, the only true protection is to install a theft deterrent system. For a fraction of the cost of your insurance deductible, NORCAL Muffler and Truck can install its propriety anti-theft prevention system to your catalytic converter. We have installed thousands of our proprietary systems, and have not had any reported catalytic converter thefts post installation. That is because our theft prevention system makes it virtually impossible for thieves to steal your catalytic converter. 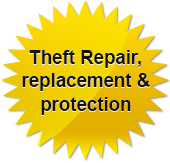 Our staff pays close attention to detail when installing our theft prevention systems, so you can feel confident that you will not become a victim of catalytic converter theft, which is both costly and time consuming. Call us today for a demonstration or free quote.